We are those annoying dog people. The people who treat their dog like a human, like a child. A spoiled rotten child. Our two-year old black lab, Fenway, has been our baby for the past two years and she damn well knows it. Many people have expressed their concern over us preparing her for the baby’s arrival. I can actually say we aren’t overly worried about it but have done a few extra things to prepare her. I believe the main thing that has prepared Fenway is the fact that my good friend had her baby at 31 weeks a year ago and the dog has been around her constantly. That preemie baby spent more than enough time last winter chilling on our couch with our dog right next to her. Now the baby is on the move on the floor, when she visits, and Fenway (reluctantly) shares her toys with her. Every Tuesday evening we go for a walk, baby in stroller, dog on leash right next to stroller, stopping to let us know when a toy has been thrown overboard. These two are buddies and while our dog hasn’t always been a fan of us paying attention to the baby, she certainly knows the smell of one. To let her know that things will permanently change in our own house soon we have prepared her in a few more ways. We have let her smell the baby clothes and blankets as we have washed and put them away. We have also let her smell the wipes, diapers and formula. She has been allowed in the nursery as we have set things up. We have set up the car seat, stroller, swing and bassinet and put them where they will reside for baby. Once they were set up, we put her favorite stuffed toy lion in them, one by one, and let her see how they worked. She rescued the lion from all objects but was able to check them out. The main thing I think we will have a problem with though is the swing, she currently does not appreciate the noises it makes when it runs. So we are running it nightly for a bit so she can get used to it. We have left objects such as bottles, binkies, and smaller toys around the house and practiced her “leave it” command with them in hopes that this curbs the desire to steal them away later. Yes, my Husband will bring home a blanket from the hospital for Fenway to smell before we make the trip home with baby. We also plan on keeping her routine as normal as possible once the baby comes. She will still go her normal days to doggie day care and she will still get her daily walks at the same time. I know this can be done thanks to the help of my sister living with us and my husband being able to take her to work with him and drop her off later at day care. We are lucky enough that Fenway seems to be officially out of the naughty puppy phase. Guests can come over and she won’t take off with their shoes, she no longer steals socks, she doesn’t hide under our bed with Rebecca’s toys and she actually uses some manners. This gives me hope that we won’t have too many other problems with her once baby does come. She currently brings toys to the bump, attempts to cuddle with her and bump often responds to her. Lets hope they remain buds on the outside world as well! 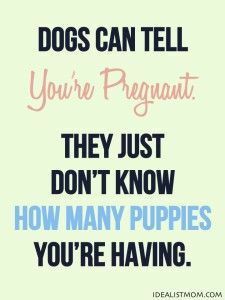 What ways did you prepare your furbaby for your human baby?